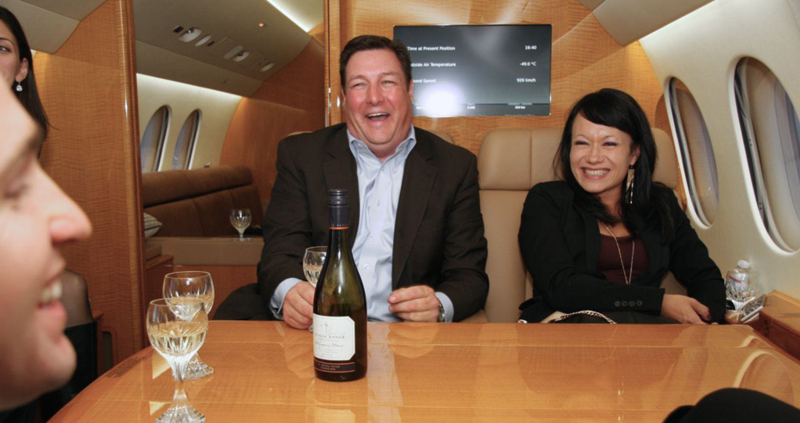 This is the story of the time I—along with a small group of the most powerful wine buyers in Las Vegas—was invited to join Terry Peabody, owner of Craggy Range winery, aboard his private jet. It was a sunny Tuesday, a week before Thanksgiving, and we were still in Las Vegas aboard Peabody’s Falcon 7X Jet on an executive tarmac around 10am. We had a reservation for lunch in Pebble Beach at noon, and later that same evening a dinner reservation back in Vegas at db Brasserie in The Venetian. This was the big idea: experience wine at different elevations with only one rule: Try not to let go of your wine glass. That rule was truly important because the glasses were heavy crystal goblets that looked like this… keep reading on FirstWeFeast.com. Tags: 30000 feet, Craggy Range Winery, First We Feast, fly ash waste, Gimblett Gravels, Las Vegas somms, MGM Grand, New Zealand Sauvignon Blanc, Pebble Beach, sommeliers, tasting wine in an airplane, Tasting Wine with a Billionaire at 30, Terry Peabody, The Bellagio.